All of these sermons were delivered in the Abbey Church. To make it easier to find a certain topic or lectionary day, click one the blue tags below (Holidays, Sundays Year A, Sundays Year B, Sundays Year C). The sermons are posted in order of their calendar date, so not all in the same lectionary year are together – keep scrolling down, and you will find more from earlier calendar years. 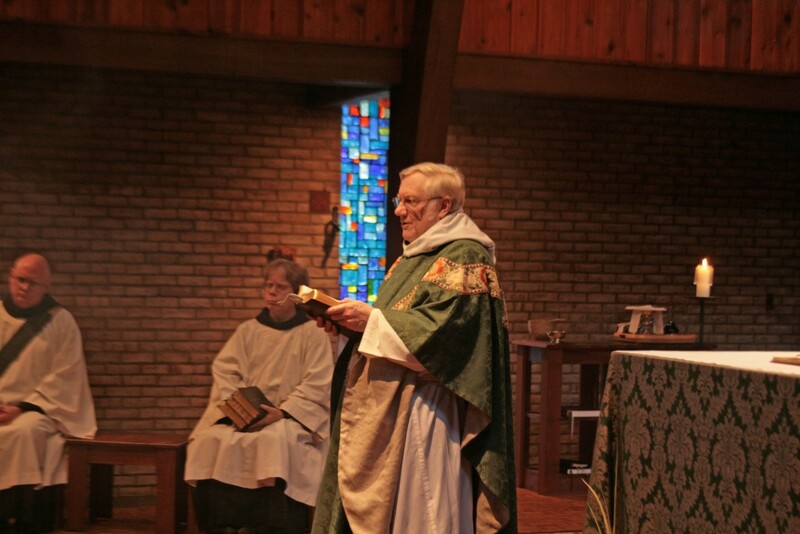 Many of Abbot Andrew’s sermons are posted on his blog. God does not call us to be more than ourselves. Being more than ourselves would not make us more than human, it would simply make us not human. Being a Christian means acknowledging that being human is good enough for God, because God chose to become human. And as all humans, Jesus grew. So we must grow. We must become mature and complete in Christ – and that means becoming more truly our unique selves. We often hear, in this church building, the call to present ourselves as a living sacrifice. We can all too easily dwell on the “sacrifice” part of that call while forgetting about the “living” part of that call. We are called to full life as God’s children. We are called many other things in scripture: the saints of God, a nation of priests, a city on a hill, the light of the world, the temple of God, the salt of the earth, the Rose of Sharon, a new creation, the body of Christ (the fullness of him who fills all things), joint heirs with Christ (and therefore his family). We are also called sinners, and that makes it even more wonderful that God calls us his children. We are not yet perfect, but we are called to perfection – not a perfection based on rules and regulations, but a perfection based on fullness. There is a Chinese proverb which says: “A mature and integrated human is like jade: Its flaws not concealing its beauty, nor its beauty concealing its flaws.” We are called to that kind of perfection, and yet how rarely we live up to it. We are not there yet; we still have a lot of growing to do, and we always will. We need to admit it to ourselves and also realize that everyone around us has a lot of growing to do. We do not like to be called evil and stupid just because we do wrong things, and so we should never use those words on others. Other people’s sins might be visible to the whole world, but ours are more likely hidden because they are deeper and far worse. If we want mercy and grace to grow then we must give it to others. That does not mean that we excuse wrongdoing, but it does mean that we always respect the wrongdoer as much a child of God as we are. It also does not mean that since we are to grow into our unique selves that we can be so eccentric that it makes life difficult for others. The ascension of Jesus (no matter if it occurred on the evening after the Resurrection or forty days later, and no matter if he went up, or out, or wherever) brings about the close of one era while preparing the beginning of another era. In one way, the works of Jesus are now over, but in another way, the works of Jesus are just beginning with the works of the church. One body of Christ was taken from the earth and replaced with another one. We are given the job of being the body of Christ: “the fullness of Him who fills all in all”, as Paul puts it in our second reading this morning. It seems difficult to fill our own little corner of the planet with grace and love, much less the entire expanding universe. Paul prays that his readers might understand a little of this when he asks that their minds might be enlightened to see the glory they will inherit – the glory of a world in harmony under Christ and in Christ. Honestly, being enlightened that much seems more than anyone could really handle. Jesus, being fully human, knows that we could never endure such enlightenment on our own, or do his work by ourselves, so he tells his disciples to go back to Jerusalem and wait for the Holy Spirit before they attempted any of it. The gift of the Holy Spirit that the disciples were to wait for is often a puzzle to Christians, or should be. The readings today do not clear up many of those questions, but it does seem clear that the Holy Spirit is a gift who enables us to spread the gospel. Often it seems that the Holy Spirit is more of a burden than a gift – when we want to spread the gospel our way instead of God’s way. Many times we are like the disciples and we want to know “when the kingdom will be restored to Israel?”, or in our words: “when will justice and peace flourish?”. Jesus says that’s not for us to know – we are instead to wait for the Holy Spirit. So, maybe the Spirit is a gift who lets us know and do what we need to know and do. Before he sends them back to Jerusalem, Jesus tells the disciples that they are witnesses to what he has said and done. We need to continue that witness – bringing to the world the Jesus that we know, not the Jesus that we don’t know. We also need to stop staring into the sky and instead wait for the Spirit to tell us what to do. Paul just told us in our second reading that “through the church the wisdom of God in its rich variety might now be made known to the rulers and authorities in the heavenly places.” That is good to hear, but it would also have been good to have heard that the wisdom of God is being made known to the rulers and authorities in earthly places, as well as in heavenly places, because we all have been given at least a little authority over some earthly things, and we sorely need the wisdom of God in order to wisely and justly fulfill our duties as stewards instead of as the capricious tyrants that we usually are. Matthew told us a story this morning about one capricious tyrant who was not pleased to be told of the light shining in the darkness, showing the way to be free of our own tyranny. We are like Herod in Matthew’s gospel story this morning, because like him, we don’t want to give up the rule of our own petty worlds. But we must, because before we can bring the good news of the light shining in the darkness to others, we ourselves must wake up to that light. We must listen to what Isaiah told us this morning and “arise and shine, for our light has come.” We must “lift up our eyes and look around, for the glory of the Lord has risen upon us.” We must abdicate our pathetic little thrones and freely allow God to rule our lives so that we can become truly alive and fully human the way we are created to be. Once that happens, we can then be light bearers to others who are in their own dark worlds created either by their own self-centeredness and self-righteousness or by that of others around them. We can be like the wise men, leading others to Jesus by our own search. Of course, we swing back and forth between the light and the dark; sometimes joyfully letting God reign in our lives, at other times miserably and mistakenly living under the false assumption that we can do a better job and so pushing God off the throne of our hearts. We don’t usually push God away on purpose. Instead, we most often crowd God out of our lives by cramming so much of our own self-importance inside us. It might be better to say that instead of chasing God away, we block our view of God, because God is always there, waiting for us to stop dreaming about ourselves so that we can open our eyes and see the real world bathed in the glory of God. When we do that, we also see ourselves bathed in the glory of God as we are meant to be. That is why we are here today. We are practicing opening our eyes, our hearts, and our lives to God by seeing God in the scriptures, in the bread and wine, and in each other. Once we get used to seeing God in those things, we will start seeing God in all things and treat every person and object with the same respect that we give to things in the church. (The monks will remember that Benedict tell us to do just that.) We know we don’t do that, or actually it is better to say that we know we don’t do that yet or we don’t do it all the time or consistently yet, so we need to keep practicing opening our eyes to God not only when we gather together, but also in our own daily private prayer, scripture reading, work, and encounters with other people. If we do these things mindfully, with good intention, constancy, and perseverance, and of course, relying solely on the grace of God, we will slowly start seeing Jesus more fully in everything the more we train our eyes away from ourselves. We will see his star rising and slowly loosen our grip on our own petty kingdoms so that we become less like Herod and more like the wise men – joyfully and freely bringing him our treasures as he becomes the treasure that we bring to others. When you are in love with someone you want to be with that person as close and as often as possible. We heard about Ahaz and Isaiah in our first reading. The story is about Judah being afraid of an attack by the Arameans. God is going to protect Judah, and wants to show King Ahaz to not be afraid. God says he will give Ahaz a sign of love and protection – a sign “as deep as Sheol or high as heaven.” That sounds like the way one feels when one is in love; everything is “as deep as Sheol or high as heaven.” Ahaz won’t ask for a sign, but Isaiah says God will give it anyway. The sign that is deep as Sheol and high as heaven is the Immanuel – God with us. God is in love with us, and is with us as close and as often as possible. God shows his love for us by being with us, even if we so often do not think we are worthy of God’s love. Maybe that is what Mary thought when the angel greeted her in our gospel story this morning. The angel said: “Greetings, favored one. The Lord is with you.” When she heard it, she was perplexed and “pondered what sort of greeting this might be.” Maybe we do the same thing – we are told God loves us and finds favor with us, but we doubt it. In response to our doubt, God shows us with a sign “as deep as Sheol or high as heaven.” The sign, written all over us, is: God is with us – God wants to be with us, to come to us, to be inside of us, and to reproduce himself inside of us. The angel told Mary: “The Holy Spirit will come upon you, and the power of the Most High will overshadow you.” That sounds a lot like the closeness that lovers enjoy – covering each other, being inside each other, using that closeness to produce a new life that will grow and add even more joy to the relationship. We are called in a similar way that Mary was. God loves us, and if we so allow it, God will come to us, cover us, and reproduce Godself within us. We can have our excuses to doubt God’s ability or desire to be in us and grow in us. Mary said: “How can this be, since I am a virgin?” We might be tempted to say: “how can this be, since I am selfish, or hateful, or dull, or impetuous.” We also might have trouble believing that anything we give birth to (even if the other parent is God) will be of any good to anyone. But with God working with us, we will give birth to exactly what is needed. Mary shows us how we are all living temples of God. As Mary carried God in the flesh inside of her, so we also carry God in us. As in any pregnancy, the outward appearance of the mother changes, so we will change outwardly as God’s presence grows inside of us. We do need to remember, though, that we are all different to start off with, so sometimes it is difficult to discern how we ourselves and those around us are changing. It is best no to judge them or ourselves anyway – just let God control the growth of everyone. Another aspect of pregnancy is the importance of the mother taking steps to insure that the person inside her is growing properly. So we also must change our habits and actions to promote the growth of God’s presence in us, so that eventually we can give birth to God in our own world – to bring God into other people’s lives by our own life. Everything comes from God; nothing comes from us – that is the theme of today, and we are grateful for all that God has given. But from our narrowly human point of view, God is good at providing only raw materials; it is up to us to put in the work required to turn these raw materials into things which are (once again, only from our narrowly human point of view) useful. So we are thankful not only for the things God has given us, but also for the ability to work – for blessing us with memory, reason, skill, and most importantly: opposable thumbs. We must also remember to work not instead of God, but with and because of God. There are a few things to help us work in gratitude and thankfulness. The first is to remember that we get the most satisfaction from our work when we do our best. We usually do that in terms of doing no less than our best, but we also need to be careful to not get caught up in the frenzied attempt to do more than our best. We have limits, and trying to go beyond them is as harmful as never trying to reach them. Work is our area of responsibility; results are God’s area of responsibility (and it is not our job to tell God what the results should be). We do our best and let God take care of the rest – that takes a huge burden off of our backs that we mistakenly took up in the first place. We also need to work not with patience, but rather with constancy. The difference in the two words is subtle, but can have a big impact on our lives. Patience means we are merely waiting until things get better, so we work with a stiff upper lip and hope for the better. Constancy means we choose to do what we consider to be the right things no matter if things ever or never get better. Patience can lead to bitterness. Constancy is already infused with joy. And we need to work out of love, not out of expectations for outcomes. One of my biggest prayers is that I hope to never see the fruit of my labors, and that we never see the fruit of the monastery’s labors (not that there will not be fruit, but that we will not see it), because when we see the fruit of our labors, we are tempted to work for results rather than out of love. A preacher in Georgia once had this to say about Jesus: “He did not come to put us to shame with his divinity. He came to call us into the fullness of our humanity, which was good enough for him.” (Barbara Brown Taylor — God In Pain). Human life is important to God. Individual humans are important to God. Human activities are important to God. In fact, all of those things are so important to God that God freely became an individual human and participated in all the common activities associated with that particular human — Jesus of Nazareth. Today we celebrate two of those common human activities: the naming of a child, and the circumcision of a child. The naming of a child is usually an important decision for the parents. They come up with lists of names and then come up with new lists of names and then come up with other lists of names, until eventually they settle on a name or two or three to give the child. Our gospel story tells us that Mary and Joseph were spared all the work of choosing a name for their child, since an angel had already said that he was to be called Jesus. Where I grew up in Texas, Jesus was a common name, although most of the Hispanic boys in my school with that name usually went by a nickname like Chuy or Beto or Junior. It was only on the first day of school when the class roll was called that you heard their real names (usually mispronounced by the Anglo teacher as Geezus instead of Haysoos). The name Jesus is not all that uncommon up here in the midwest, either, although most of the time it is pronounced Joshua, which is simply the anglicized version of the real semitic form of Jesus. The name Jesus (in its semitic form) was not all that uncommon in Jesus’ time, either. There are several Jesuses in the Bible. Some English translations have them as Jesus, some as Joshua. In fact, the prisoner who was released instead of Jesus by Pilate was named Jesus Barabbas, which means Jesus Son of the Father. A common human name was good enough for God. The circumcision of a child — a male child — is also an important decision for the parents. Now days the matter to be decided is “should we or shouldn’t we”. Once again, Mary and Joseph were spared this decision because in their time and place, it was simply the thing to do. It was a common, although quite meaningful human activity, and it was good enough for God. The circumcision of Jesus also shows us that Jesus had all his human parts. A common human body was good enough for God. If we keep reading the gospel after the section we heard today, we hear a little about Jesus’ childhood and adolescence. Not many details are given, but twice in this chapter Luke mentions that Jesus kept growing. A common childhood and adolescence seem to have been good enough for God, also, and even though his later years were a little extraordinary, they were lived out in the ordinary society of the time and place. In fact, if we really believe it when we say that Jesus is fully God and fully human, we are saying that we believe that every human bodily function, every human urge and desire, and every human fear, joy, pleasure, and pain were experienced by God in Jesus. All of those things belonged to Jesus, and therefore they belong to God. Since whatever belongs to God is holy, then all of human life is holy — every bodily function, every urge and desire, and every fear, joy, pleasure, and pain. Because of the creation, we bear God’s image — because of the incarnation, God bears our image. We are doubly holy. We are also doubly responsible for treating ourselves and each other as the holy beings that we are. We must take care of our holy human bodies, as well as our holy human spirits and souls. Our bodies, minds, emotions, and spirits need proper care to function as best as they can. Our intellectual, sexual, social, and family lives must never be forgotten, abused, or neglected. Mistreatment or improper use of any parts of our lives degrades their holiness and lessens us and the entire human race. We don’t always seem all that holy to ourselves or to others, but that’s because although we are holy, we are human, and humans grow. Our holiness must grow, and in order to grow it must be fostered and cultivated with love. As the years and decades of cultivating our holiness roll by, we will seem ever so slightly more holy. This morning’s Old Testament story of Moses’s face shining with glory after coming down from the mountain of God happens shortly after the incident of Aaron making the golden calf that was worshipped by the former slaves, causing Moses to smash the tablets of law that God gave him the first time they met on the mountain. This morning’s gospel story of Jesus shining with glory happens the day before his disciples fail to heal a boy of demon possession, a failure that Jesus attributes to their perverseness and lack of faith. So in these two stories, we have the glory of God shown both before and after major instances of human faithlessness. Though not specifically stated in these scriptures, it could be inferred that the glory of God shining from Moses’s face was meant to reassure the people that even after their infidelity, God was still in their presence and was still guiding them. Similarly, it has often been assumed that the incident of Jesus’s transfiguration was meant to strengthen the disciples and prepare them for the crucifixion, even though they would be unfaithful many times before and after it. So it is still with us. Like Aaron, we make our own gods out of the things we can accomplish, rather than trusting in the true God to guide us. And like the disciples, we often lack the faith to cast out the demons that hurt us and those around us. But even with all that faithlessness on our part, God still loves and cares for us, and gives us signs to strengthen us and reassure us of his presence in our lives. We may not see Moses or Jesus shining with glory, but we can, if we choose, see God’s glory in the wonderful universe around us. We can see God’s love and care for us in our family and friends, and even in strangers who treat us with kindness. Sometimes those signs are hard to see and understand, especially when it seems that the universe is being cruel to us, or when those around us abuse us or are lost to us. That is why Jesus gives us another sign of God’s glorious presence in our lives. Every time we gather at the table up here, God shows his presence in our lives by feeding us with himself. We not only gather together with Jesus to share a meal with him, we partake of his being as he freely gives his body and blood to us. The very life of God is given to us, and since we gather together with others at the table, we are assured not only of God’s presence in our own lives, but also of God’s presence in the lives of all those who share in the meal. The meal we are about to consume at this table is not merely some kind of symbol of our life with Jesus (although it is that); it is a tangible conduit of his presence in us and in our world. We are what we eat, and as we partake of the life of Jesus, we grow ever more into his likeness as we take that likeness into our own small corner of the universe, bringing God’s shining glory to those who need it. There have been too many quarrels about how the bread and wine that is used at celebrations of the Lord’s Supper is or becomes the body and blood of Christ. It is difficult to see much good that has come from all the bickering over this question. The eucharist, which is supposed to be an act of remembrance that serves as a source of unity and joy, is instead (for many people) a source of conflict and division. Why have we not more often followed the example of Jesus on this question? When some of the people asked: “How can this man give us his flesh to eat?”, Jesus did not answer with explanations and theories, he simply told them to eat. There are some instructions concerning the proper way to celebrate the eucharist which have come down to us through scripture and other tradition, and we should expect ourselves and other Christians to follow these instructions, but we must do so with the full knowledge that we are not doing exactly the same things as Jesus and his friends did that night. We just don’t have or know all the customs that Jesus and his friends had, but we can do what we can to be faithful to the request that we eat and drink together in remembrance of Jesus. We heard some instructions about how to celebrate the eucharist from Paul’s Letter to Corinth in our second reading this morning. The Corinthians were having trouble in their celebrations of the eucharist, so Paul is trying to help them, and if you read the few paragraphs before our passage this morning, the trouble that he mentions has nothing to do with academic arguments over sacramental theology – the trouble is the fact that poor people and rich people were being treated differently at the meal. Paul tells the Corinthian Christians that this division shows contempt for the church of God, and that their improper celebration of the Lord’s Supper brings judgment upon them. He actually says that they bring judgment upon themselves by eating and drinking without discerning the body. The Body that they were incorrectly discerning is not only a reference to the Last Supper where Jesus took the bread and said: “this is my body”, it is also a reference to the people who were sharing that bread, for in the same letter to Corinth a few paragraphs later, Paul says: “You are the body of Christ.” As Augustine of Hippo once said: “There you are upon the table…there you are in the cup.” (sermon 229) We need to have that in mind when we come together at the table up here – just as the bread that we eat up here is the Body of Christ (how and why we don’t know), so the people around the altar eating the bread are the Body of Christ (how and why, we don’t know). We treat the consecrated bread from the altar with respect and reverence, as we should. However, if we do that, we should also treat each other with just as much respect. Reverence toward one form of Jesus is mocked by disrespect toward the other. We know we don’t always reverence each other as we should, but we also know that we are trying to grow so that we do. We also have the sure hope that the more we come together and believe together at the altar, the more we will be changed from the inside so that our outside actions match our desire, and that hope is met with grace. We can also work from the outside in order to help our inward desires become more Christlike, and that outward work is also met with grace. There is some help in this regard from our reading in Deuteronomy this morning. Moses is speaking to the Hebrews as they prepare to cross the Jordan into their promised land. He asks them to keep all the commandments – not out of fear of God, but because those commandments will help them live in increasing joy and prosperity. He reminds them that the hardships they encountered while wandering in the wilderness were a means of preparing them for their life in the promised land. One of the ways of preparation was to allow them to hunger so that they would have to rely on God to feed them. Moses said this was a form of discipline. We are God’s friends. We just heard Jesus say: “I do not call you servants any longer… I have called you friends… “. It is good to be with friends. When we are with friends, we can be ourselves without worrying about appearances. We can do ordinary, everyday things and find great satisfaction in them: sitting on the couch, riding around in the car with no particular destination, goofing off at work, talking about silly or stupid things, or maybe not talking at all. Friendships thrive on the ordinary, everyday things in life, not on the spectacular. Spectacular things may happen, but they can not be the basis of friendship, because spectacles don’t last, and neither do those things based upon them. And our friendship with God is meant to last. Right before Jesus calls his disciples friends, he says “abide in my love”. Right after he calls them friends, he tells them to “bear fruit, fruit that will last”. Both abiding and bearing fruit take time and require stability. They can’t be rushed, and they involve a lot of unspectacular, everyday work. We might not think of abiding taking a lot of work, but just think of all the people you know who can’t sit still for five minutes, much less keep the same address for a year or two. We might have a better concept of the labor involved in bearing fruit, not merely from the viewpoint of having a summer garden, but even more so of planting and tending an orchard or vinyard. Abiding in God’s love and bearing fruit are much the same: they take a lot of work, patience, fortitude, and time, and they might not be the most glamorous thing to do, but they are what God our friend has asked of us. We heard Paul writing to the Ephesians about abiding and bearing fruit when he prays that they “may be strengthened in their inner being… and that Christ may dwell in their hearts… as they are being rooted and grounded in love.” All of that suggests a lengthy process, not a one shot emotional or spiritual rocket to heaven. Rockets may go off every now and then, but they are not necessary, because heaven is not a place we need to get to – heaven is a place we need to cultivate and abide in. If we abide in Jesus, and allow him to abide in us, then heaven can and should be wherever we are, and that is why we need to work so patiently to bring it to fruition. We bring heaven to our world in simple ways; making God’s love a concrete thing for those around us. A tv preacher once said an unusually smart thing by commenting that people don’t make love in bed, they celebrate love in bed. Love is made earlier in the day by cooking, cleaning, and otherwise earning a living. That’s what we should do as God’s friends – at home, at work, in the monastery or at our parish – making love for and with others by doing our simple, daily round of chores in peace and joy, thereby slowly and surely helping to bring heaven to those around us. Every once in a while we might have the chance to do something spectacular, and of course we should do the best we can when that happens, but we shouldn’t be disappointed if the opportunity never occurs. As Mother Teresa of Calcutta said: “we don’t need to do big things, we only need to do the little things with love”. The big things might seem more important and heroic, but in the end they are much easier than the little things, because the little, everyday, ordinary things never end, and they can easily become drudgery if not done in thoughtfulness and love. The story of Abram which we heard today is a good example of patiently abiding and bearing fruit. It may sound strange to say that a man who spent his entire adult life wandering around the middle east is a good example of patiently abiding, but Abram’s home was in God, no matter where he pitched his tent. Abram lived in God’s promise through good times and bad, through doubt and surprise, and because of his constancy, produced fruit that is still blessing the world. A lot of spectacular things happened while Abram traveled (including having his name changed to Abraham), and we read about them to help us in our life with God, but it was the ordinary, everyday work that made those big things possible: pulling down the tents, setting them up again, grazing and watering the flocks, finding suitable places to camp, calming fights between wives and concubines. That’s a lot of hard work, even with all his slaves. We should be thankful for his work and patience, and we should follow his example.